Back in December I was writing about problems with a HiFiBerry audio interface for Raspberry Pi. 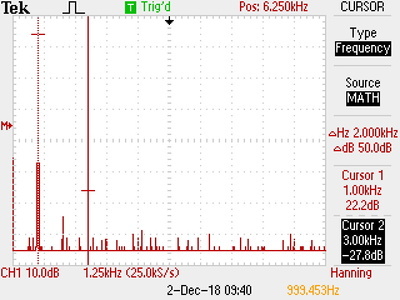 The audio board was apparently emitting interference on the 2.4 GHz frequency band and made the wireless LAN connection on the Raspberry Pi unreliable. I got in contact with their support and they acknowledged that the oscillators on that version of their hardware had an EMI problem. They promised to get back when they've fixed the issue and indeed in April they offered to replace the old board free of charge or sell me a new one for half the price. I opted for the latter option, since I was curious what changes they made to the design and wanted to compare the boards side-by-side. 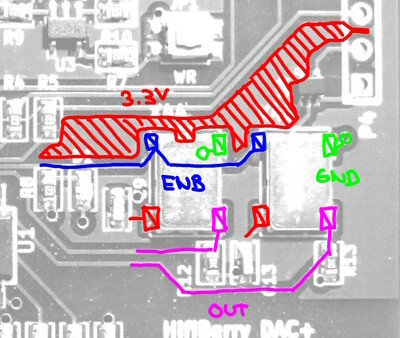 This is the old board, marked HiFiBerry DAC+ HW 2.2. The components marked with X44 and X48 are Fox Electronics Xpresso-series hybrid oscillator modules. Each of these contains an integrated circuit and a quartz crystal resonator. Unfortunately they are unmarked and I didn't bother to measure their frequency. 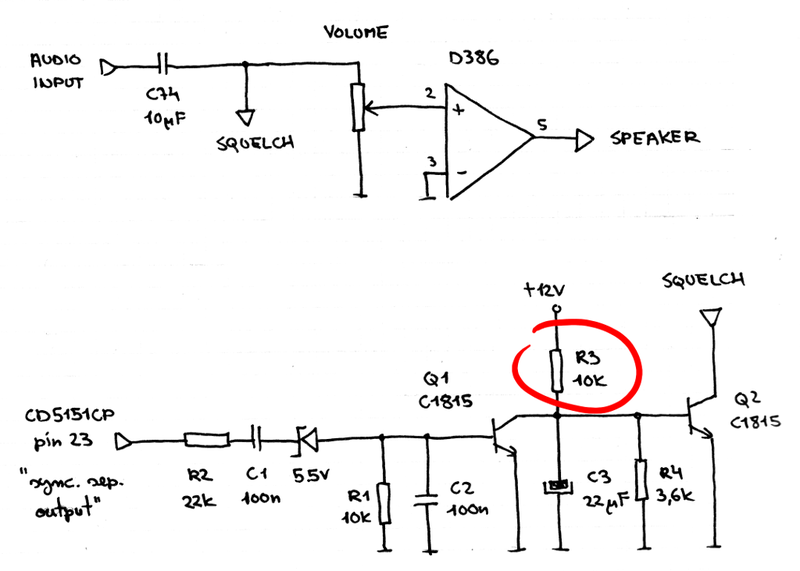 From their designations I'm guessing one provides the clock for the 44100 Hz sampling rate and the other for 48000 Hz. 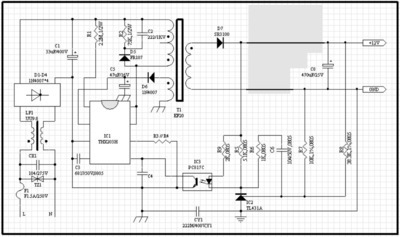 Datasheet for the PCM5122 ADC suggests that the oscillators themselves are in the 10 MHz range and the clocks are then divided down inside the ADC chip. This is the new board I got. It's marked HW 2.6. The gold hybrids have been replaced with similar looking components in black plastic packages. Xpresso-series has apparently been discontinued. The new oscillators are marked only with letters BOHXA and after a brief web search I didn't manage to find their manufacturer. The new board also omits the push-button. I'm not sure what its original function was anyway. Apart from the new oscillator hybrids the most obvious change is the removal of two large copper fills on the top layer of the PCB. These large areas of copper on the top layer are all connected to the 3.3V supply. The bottom layer of the board remains one big ground plane. The copper fill near the oscillators looks especially suspicious. It was only connected to the 3.3V supply with a narrow bridge between the pins of P4 on the right. It provided supply voltage to U4 and nothing else further down to the left side. It seems like it could accidentally form a quarter-wave stub antenna. It's approximately 25 mm in length, so the resonance could well be somewhere in the GHz range. This is near enough to the 2.4 GHz band that I think it would be feasible for it transmit some oscillator harmonics out from the board. It would be interesting to see if this stub was indeed causing the problems. It should be easy to drill a hole through and decouple the left end of it with a SMD capacitor to the ground plane on the bottom layer. I could then repeat the near-field measurements I did last year to confirm. I'm not sure if I will bother though. The new board does indeed fix the problem with the Raspberry Pi built-in Wi-Fi radio and I currently don't have any particular use for another audio board. 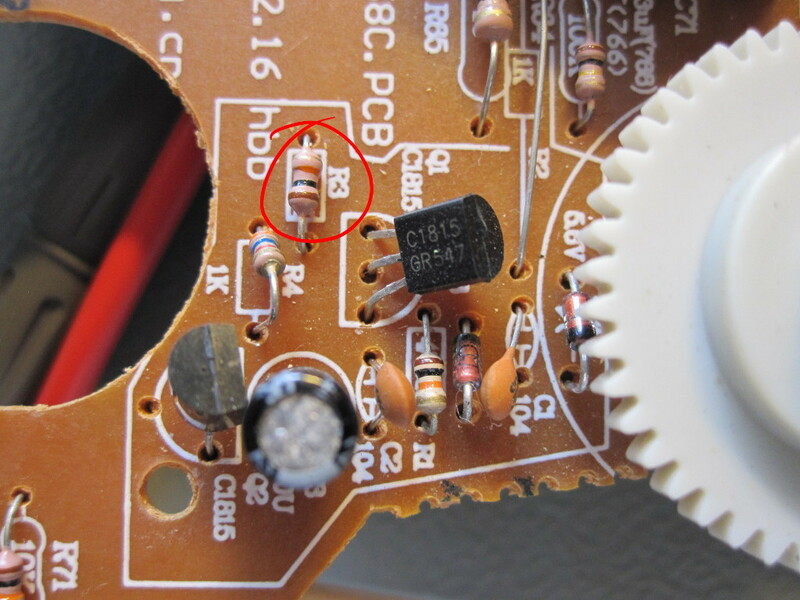 Last time when I was tinkering with the insides of my portable CRT TV (UTV 6007) I happened to notice one more odd thing. One of the smaller through-hole resistors near the high-voltage transformer looked charred from heat. Ever since this TV was new it had a little bit of that characteristic smell of overheated electronics. However it worked fine, so I didn't worry too much about it and it's not unusual for cheap plastic to smell a bit when heated. But this here looked serious enough to look into it even though from the outside there were still no apparent problems. The size of the resistor suggested a 1/8 W rating. The body was too blackened to read out the colors. The position is marked with R75 and the silkscreen print underneath helpfully says it should be 1 kΩ. However I've seen that other resistors on this board sometimes don't match the values printed for their positions. 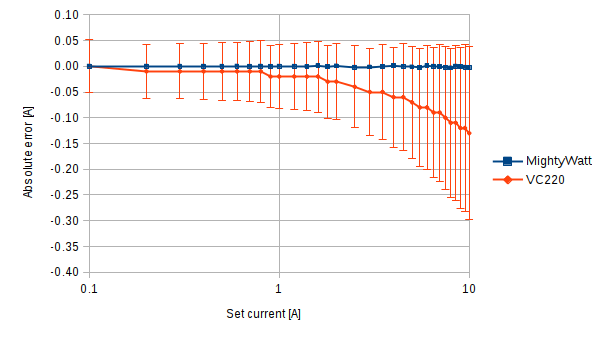 Out of the circuit, the resistor measured around 900 Ω, which seemed consistent with a slightly damaged 1 kΩ. Just to be sure, I traced the circuit around it to see what its function was. 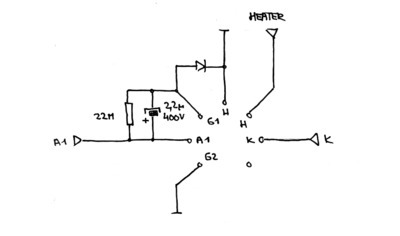 The following is the relevant part of the circuit on the main board around the HVT. Only the low-voltage secondary winding providing a few 100 V for the first anode is shown here. I also traced the small circular board that sits directly on top of the electron gun pins and is connected to the main board with a (very flimsy looking) 4-wire flat cable. I didn't find the exact pin-out for this tube, so take the pin markings with a grain of salt. However this pin-out seems consistent with how the typical cathode ray tube is connected. 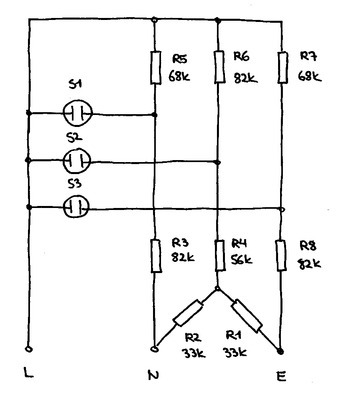 For reference I used the one shown in the KA2915 datasheet and a few old TV schematics my father found in his library. The cathode K has a positive bias relative to the ground. The bias can be adjusted with the Brightness knob. The first grid G1 is grounded and is hence negative relative to the cathode. First anode A1 is on a higher positive bias relative to the ground and is hence positive relative to the cathode. The second grid G2 either isn't present in this tube or is grounded as well. There is no apparent focus adjustment. The video signal is connected to the cathode. It varies cathode potential relative to the first grid and so controls the intensity of the electron beam and thus the brightness of the spot on the phosphor. The capacitor and diode arrangement between A1, G1 and ground is interesting. 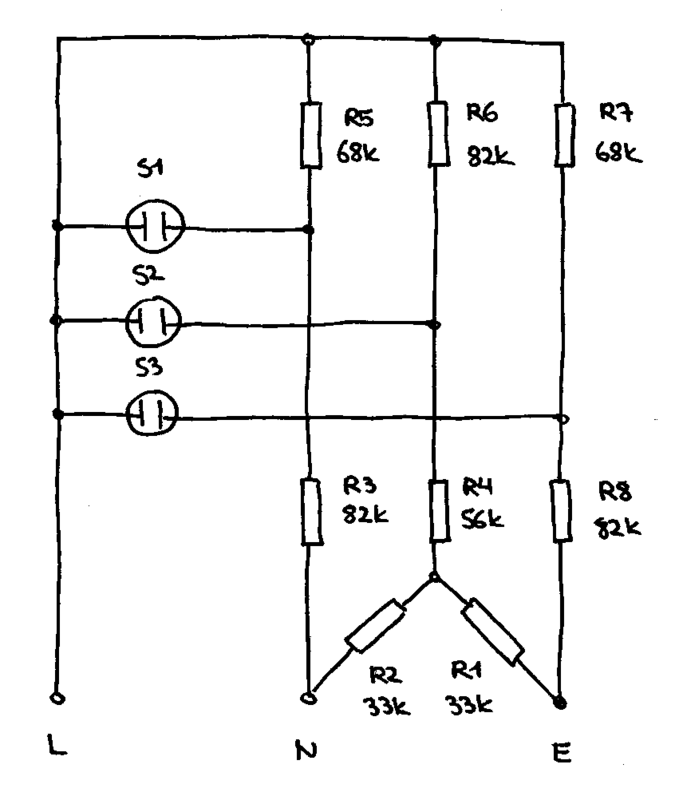 Something similar is present on all CRT circuits I've seen (see D3 here for example, from this project). Its purpose might be to put a high negative bias on G1 to stop the electron beam when the device is turned off and A1 goes low. I know that a lingering electron beam in old TV sets sometimes burned out a spot in the screen if the beam didn't shut down before the deflection. This may be there to prevent that. 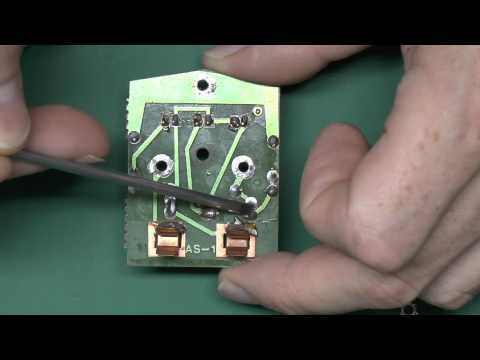 In any case, the R75 is in circuit that provides the anode voltage. 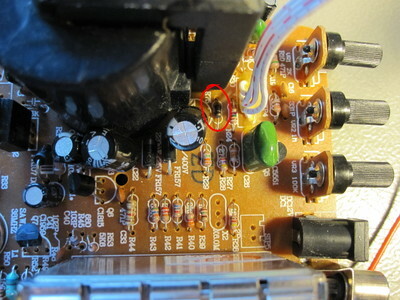 Only the small anode current should flow through it, and the charging current for the 2.2 μF capacitor for a short time after the TV is turned on. It's not apparent what caused it to heat up so much. The capacitor seems fine, so perhaps something arced over at one point or the TV was turned on and off several times in short succession. Since the circuit seemed to be consistent with the suggested 1 kΩ value, I replaced the resistor with a new one. I used a standard 1/4 W carbon resistor I had at hand and left it on longer leads for better cooling if something similar happened again. As expected, the TV runs just as well with the new resistor in place as it did with the old burned up one. There's currently no sign of it overheating, but perhaps I'll check again after some time. I love playing with this old stuff. Analog TV was one of the pinnacles of consumer analog technology and it's fascinating to see how optimized and well thought out it was at the end of its era. This particular specimen is surprisingly repairable for a device that I got new in the store for 20 €. Components are well marked on the silk screen print and most have their values printed out as well (even if those don't always match reality). The only thing more I could wish for is that I could run it with the case opened without a special contraption for holding the CRT. I just don't have any luck with Maker Faires it seems. I had everything packed and prepared for the event last week and then spent the weekend in bed with a fever. Sincere appologies to anyone who wanted to see the Galaksija. I'm sure there were more than enough other interesting exhibitions to make the visit worth your time. 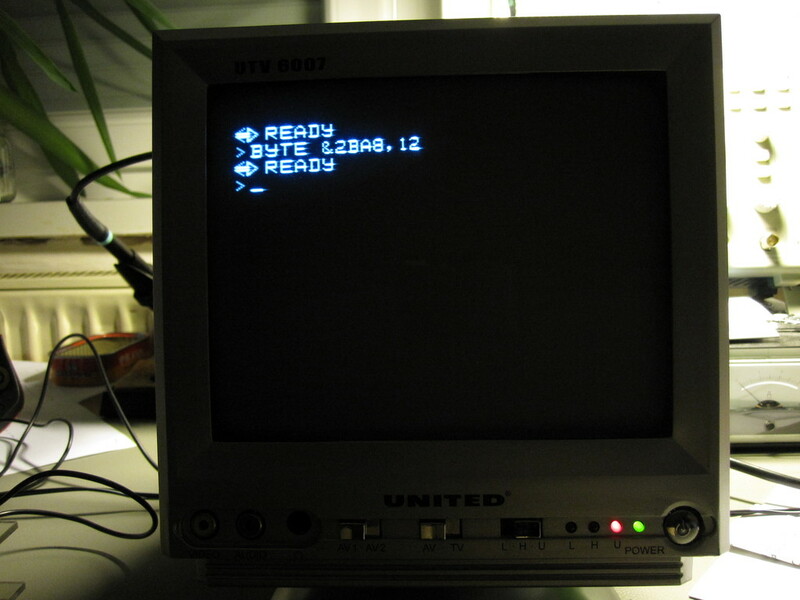 In the weeks leading to the Maker Faire I came across an old problem with the small analog TV (United UTV 6007) that I use with vintage computers. Ever since I first played with Galaksija's audio capabilities I noticed that sound gets very distorted when played through the TV speaker. I never really looked into it. I just assumed that perhaps voltage levels were wrong for line input or the high-frequency components of 1 bit music were interfering with something. Since I had Galaksija already setup on my bench, I decided to investigate this time. 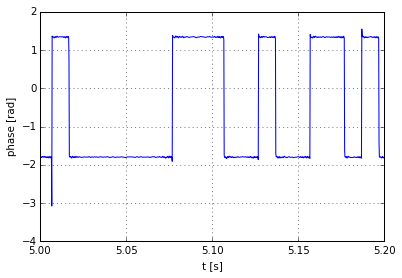 It turned out that a clean sine wave from a signal generator also sounded very choppy and distorted. On the other hand, audio from a DVD player sounded perfectly fine. This made me curious and I took the TV apart. UTV 6007 is built around the CD5151CP integrated circuit. It's very similar to the camping set TV described in this post about adding a composite video input to it. The post on Bidouille.org also has links to a bunch of useful datasheets. UTV 6007 already has a composite video and an audio line input out of the box, which was one of the reasons I originally bought it. I traced the audio path on the board to this curious circuit near the volume knob. I'm not sure what "hbb" stands for, but the circuit has a squelch function. It mutes the speaker when there's no picture displayed. This makes the TV silent when it's not tuned to a channel instead of playing the characteristic white noise. It actually takes a surprising amount of real estate on the small PCB. 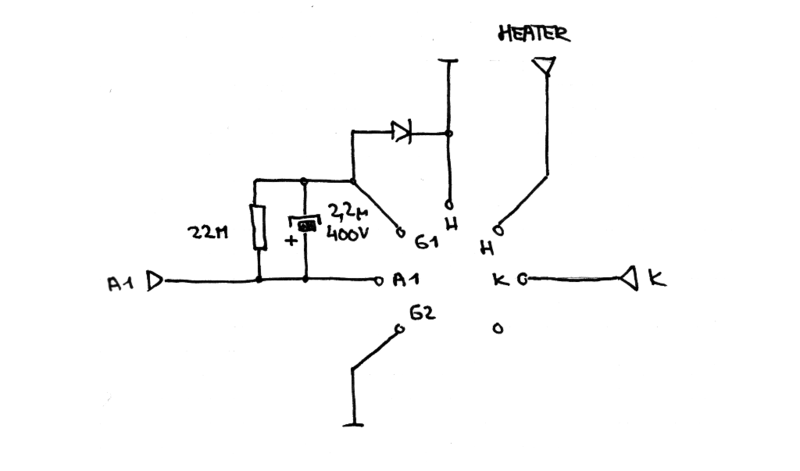 This is the relevant part of the circuit traced out. The squelch takes input from the sync. 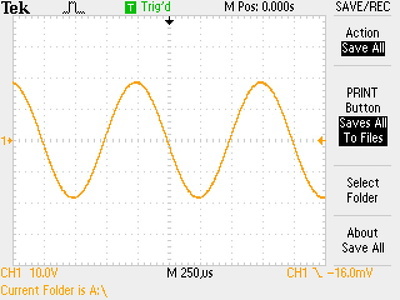 sep. output on the CD5151CP. This is probably a signal that contains only synchronization impulses separated out from the video. 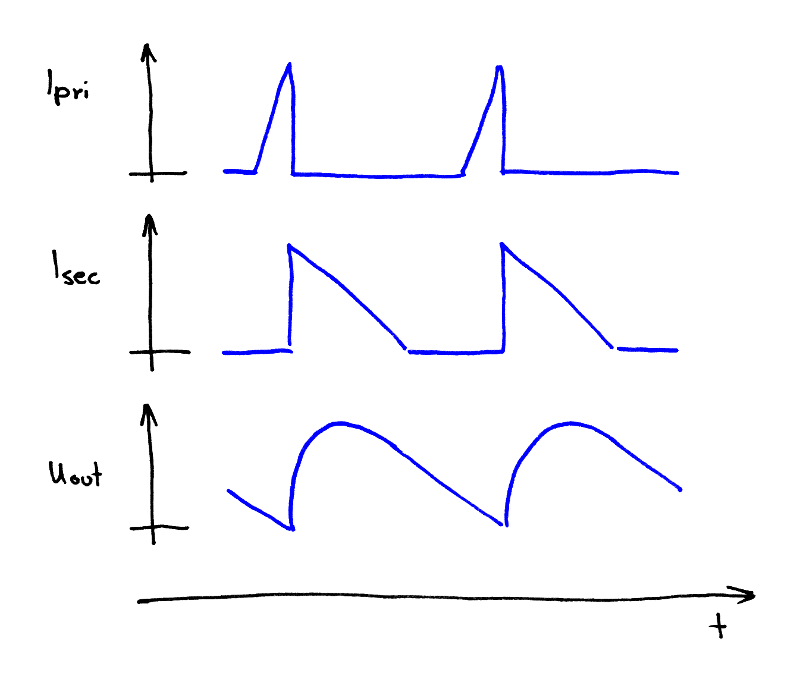 R1, C1, R2 and C2 form an impulse filter. Positive impulses between 150 μs and 5 ms will open Q1. This discharges C3. If no impulses are present, R3 will in about 14 ms charge C3 to the point that Q2 opens. Q2 shorts the audio amplifier input to ground, making the output silent. Q2 seems somewhat odd, since its collector doesn't have any bias current. So at first glance it appears that it would not be able to ground negative half waves of the audio signal. 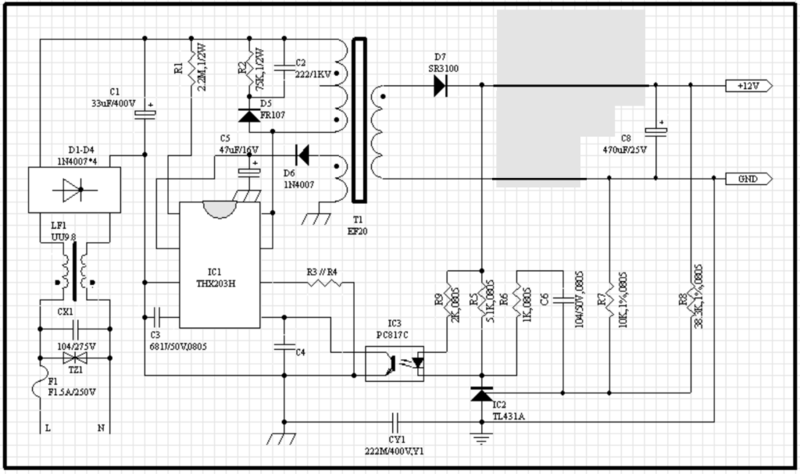 However, D386 amplifier has a bipolar differential input stage that sources base current. Apparently that provides sufficient collector current for Q2. 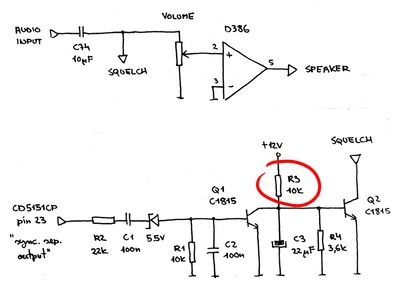 In fact, the audio circuit (without the squelch) is identical to one of the D386 reference designs. These timings suggest that the circuit detects vertical video synchronization. Unfortunately, the compact design of the TV makes it non-trivial to power it up while the circuit board is accessible. I didn't want to bother with any special setup, so I don't have any actual measurements. 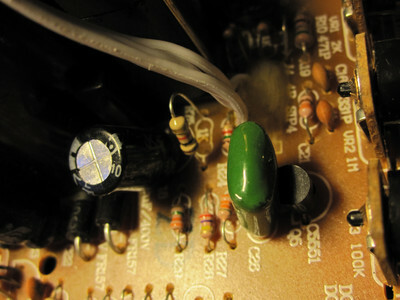 Sound distortion suggested that Galaksija's video signal was making this circuit erroneously trigger for a short time once every frame, which made for a choppy sound. Galaksija's video is in fact somewhat out-of-spec (for instance, it's progressive scan instead of interlaced). Since I was not sure which timing exactly was the culprit, I opted to simply disable the circuit. I guess in the age of digital TV some untuned television noise just adds to the retro style of the whole setup. To disable the squelch I removed the R3 resistor. Without it, Q2 can't get any base current and hence always remains closed. A quick test confirmed that with that modification in place Galaksija sounds as it should on the TV speakers. 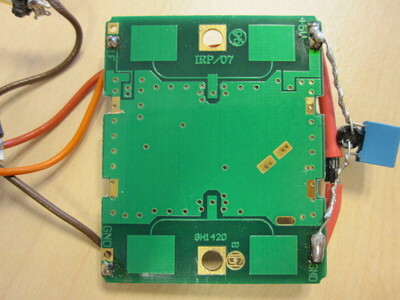 In the past few years I designed a series of small VHF/UHF receivers. They are all based on TV tuner chips from NXP semiconductors and the STM32 series of Cortex-M3 microcontrollers. 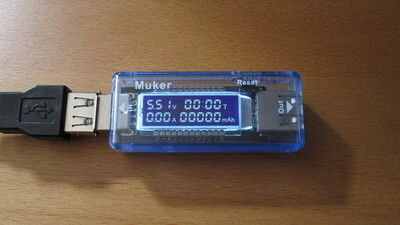 The receivers were originally intended for experiments with TV whitespaces, such as detecting the presence of wireless microphones. However, European projects come and go, and so recently my work at the Institute has shifted towards ultra-narrowband technology. I keep using my old hardware though. Partly because it is convenient and partly because it's interesting to find where its limitations are. With ultra-narrowband, phase noise is often the defining characteristic of a system. Phase noise of a receiver is a measure of the short-term stability of its frequency reference. One of its effects is blooming of narrowband signals in the frequency domain. 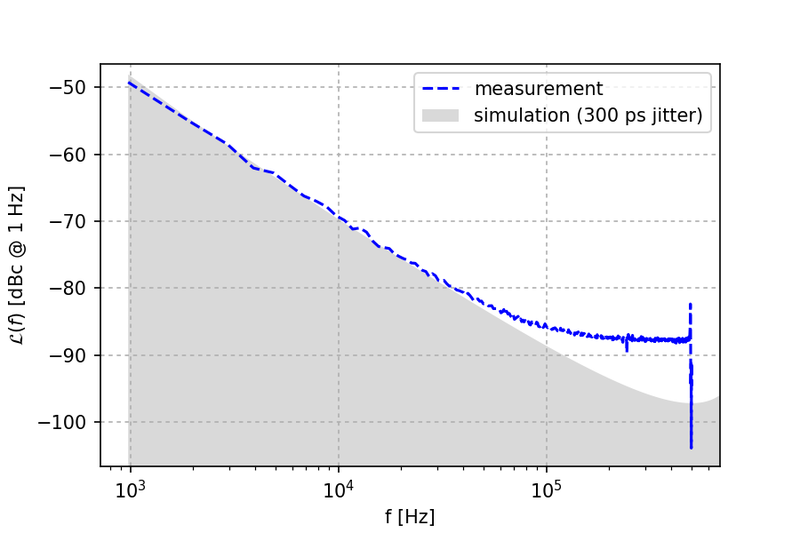 A common way to specify phase noise is in decibels relative to the carrier (dBc), at 1 Hz equivalent bandwidth at a certain offset from the carrier. This slide deck from Agilent nicely explains the concept. 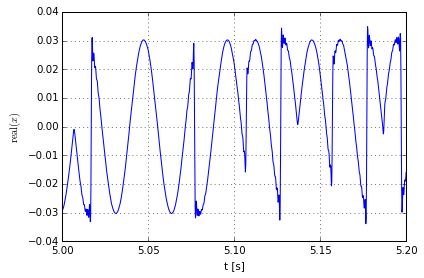 Not surprisingly, my design has quite a lot of phase noise. This was not a concern when receiving wide band FM microphone signals. However, it turns out that it's not the RF part that is the culprit. 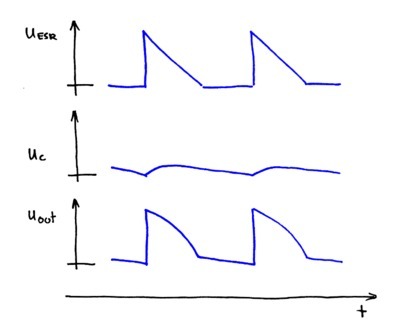 Most of the phase noise in the system comes from the analog-to-digital converter in the ARM microcontroller that I use to sample the baseband signal. 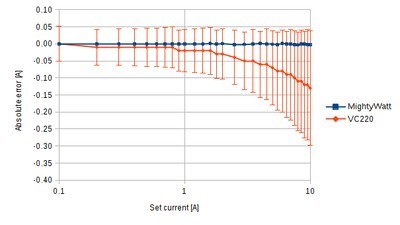 I investigated this using the same setup I used for my ADC undersampling measurement - in the following measurements, no RF circuits were involved. Proper lab equipment of course is significantly better. 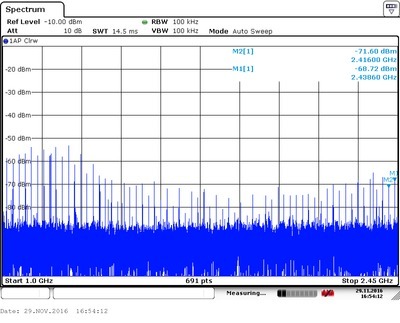 The Rohde & Schwarz SMBV signal generator I used in the measurement only has -148 dBc of phase noise specified at 20 kHz offset. 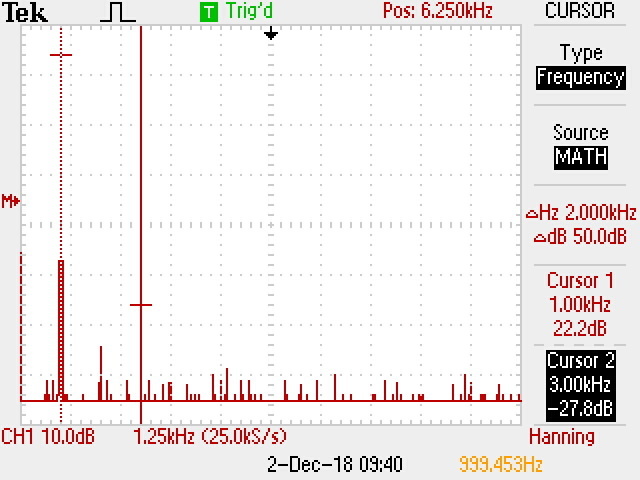 What causes this phase noise? The ADC in the microcontroller is driven by the system clock. The accuracy of this clock determines the accuracy of the signal sampling and in turn the phase noise in the digital signal on the output of the ADC. In my case, the system clock is derived from the high speed internal (HSI) oscillator using the integrated PLL. 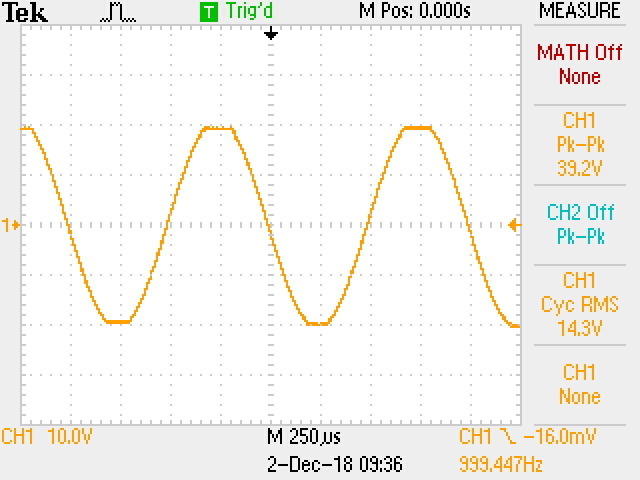 The datasheet doesn't say anything about the oscillator, but it does say that the PLL cycle-to-cycle jitter is at most 300 ps. 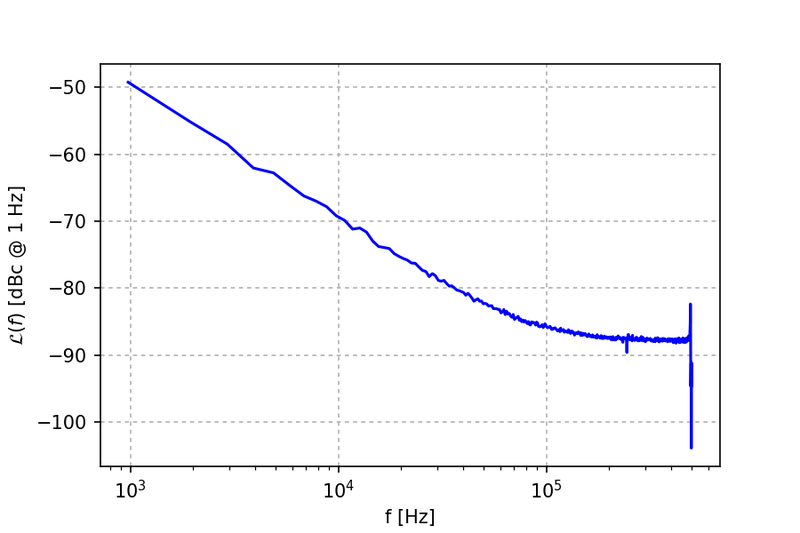 So it seems that the PLL is responsible for most of the phase noise. Unfortunately, it appears that I can't avoid using it. There is no way to run the integrated ADC from a separate external clock. I could run the whole system from a low-jitter high-speed external (HSE) clock without the PLL, however HSE is limited to 25 MHz. This is quite low compared to my current system clock of 56 MHz and would only be feasible for significantly lower sample rates (which would require different analog anti-aliasing filters). External ADC triggering also wouldn't help here since even with an external trigger, the sample-and-hold circuit appears to be still driven by the ADC clock. For some further reading on the topic, I recommend Effect of Clock Jitter on High Speed ADCs design note from Linear, which talks about phase noise from the perspective of serious ADCs, and Phase Locked Loop section in STMicroelectronics AN2352. Recently I was writing about how my father and I were checking a HiFiBerry board for a source of Wi-Fi interference. For want of better equipment we used a crude near-field probe that consisted of a loop of stripped coaxial cable and a trimmer capacitor. We attempted to tune this probe to around 2.4 GHz using the trimmer to get more sensitivity. However we didn't see any effect of capacitance changes on the response in that band. The probe was made very much by gut feeling, so it wasn't that surprising that it didn't work as expected. We got some interesting results nonetheless. Still, I thought I might do some follow-up calculations to see how far off we were in our estimates of the resonance frequency. Working backwards from the equations above, we would need capacitance below 1 pF or loop diameter on the order of millimeters to get resonance at 2.4 GHz. These are very small values. Below 1 pF, stray capacitance of the loop itself would start to become significant and a millimeter-sized loop seems too small to be approximated with lumped elements. 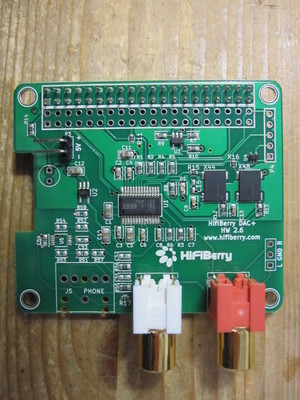 HiFiBerry is a series of audio output cards designed to sit on the Raspberry Pi 40-pin GPIO connector. I've recently bought the DAC+ pro version for my father to use with a Raspberry Pi 3. He is making a custom box to use as an Internet radio and music player. I picked HiFiBerry because it seemed the simplest, with fewest things that could go wrong (the Cirrus Logic board for instance has many other features in addition to an audio output). It's also well supported out-of-the-box in various Raspberry Pi Linux distributions. Unfortunately, my father soon found out that the internal wireless LAN adapter on the Raspberry Pi 3 stopped working when HiFiBerry was plugged in. Apparently other people have noticed that as well, as there is an open ticket about it at the Raspberry Pi fork of the Linux kernel. Several possible causes were discussed on the thread on GitHub, from hardware issues to kernel driver bugs. From those, I found electromagnetic interference the most likely explanation - reports say that the issue isn't always there and depends on the DAC sampling rate and the Wi-Fi channel and signal strength. I thought I might help resolving the issue by offering to make a few measurements with a spectrum analyzer (also, when you have RF equipment on the desk, everything looks like EMI). I don't have any near-field probes handy, so we used an ad-hoc probe made from a small wire loop on an end of a coaxial cable. We attempted to tune the loop using a trimmer capacitor to get better sensitivity around 2.4 GHz, but the capacitor didn't have any noticeable effect. We swept this loop around the surface of the HiFiBerry board as well as the Raspberry Pi 3 board underneath. During these tests, the wireless LAN and Bluetooth interfaces on-board Raspberry Pi were disabled by blacklisting brcmfmac, brcmutil, btbcm and hci_uart kernel modules in /etc/modprobe.d. Apart from this, the Raspberry Pi was booted from an unmodified Volumio SD card image. Unfortunately we don't know what kind of ALSA device settings the Volumio music player used. 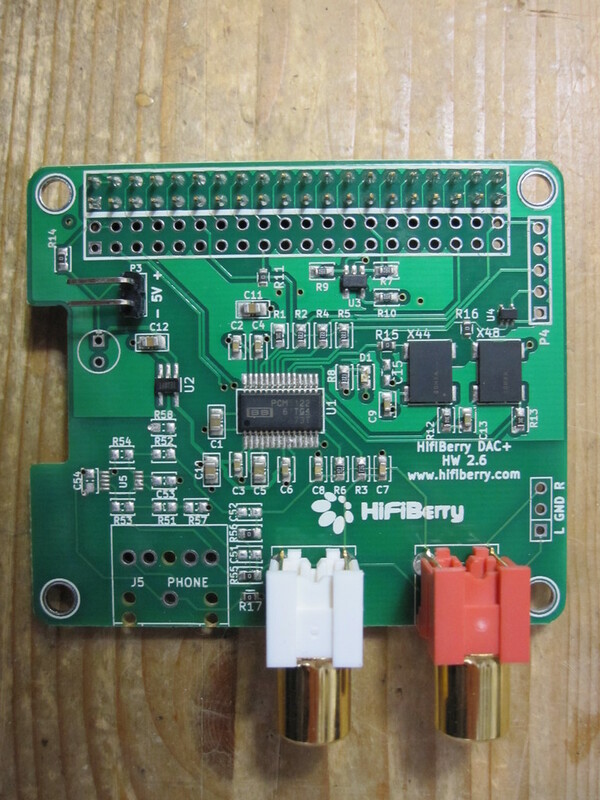 What we noticed is that the HiFiBerry board seemed to radiate a lot of RF energy all over the spectrum. The most worrying are spikes approximately 22.6 MHz apart in the 2.4 GHz band that is used by IEEE 802.11 wireless LAN. 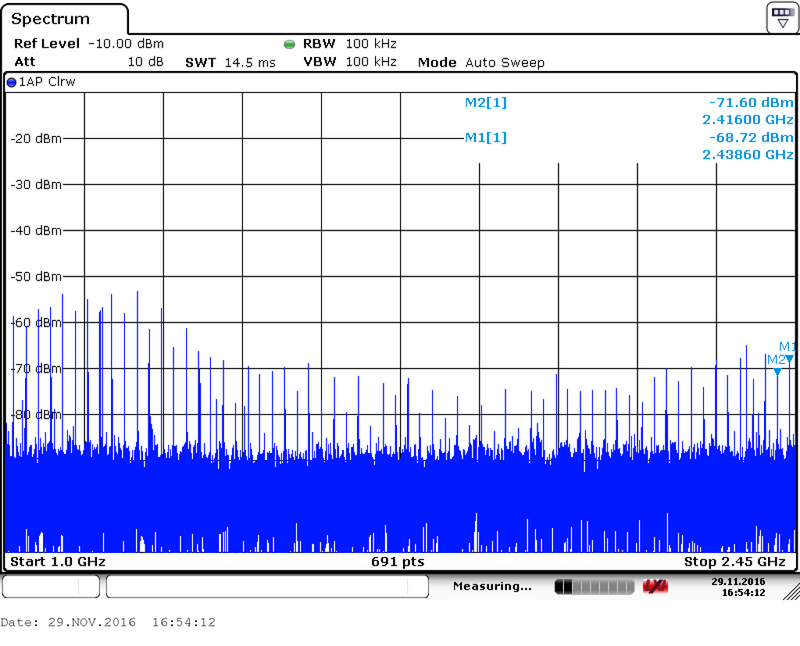 Note that the peaks on the screenshot below almost perfectly match the center frequencies of channels 1 (2.412 GHz) and 6 (2.437 GHz). The peaks continue to higher frequencies beyond the right edge of the screen and the two next ones match channels 11 and 14. This seems to approximately match the report from Hyperjett about which channels seems to be most affected. The spikes were highest when the probe was centered around the crystal resonators. This position is shown on the photograph above. 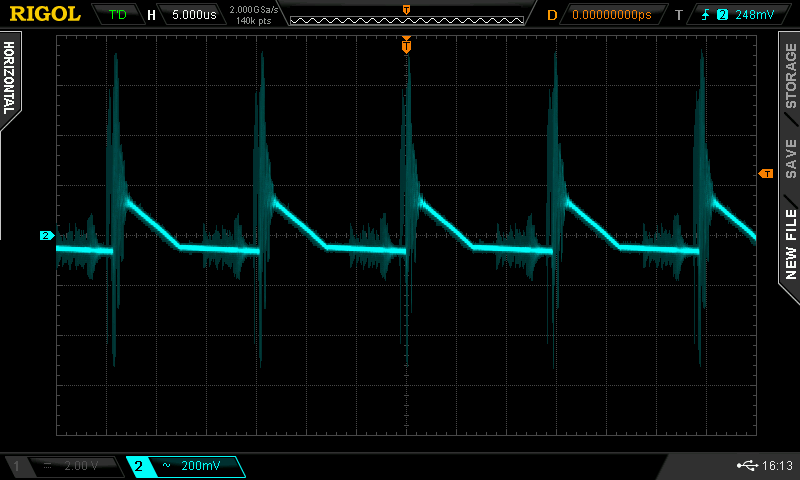 This suggests that the oscillators on HiFiBerry are the source of this interference. Phil Elwell mentions some possible I2S bus harmonics, but frequencies we saw don't seem to match those. 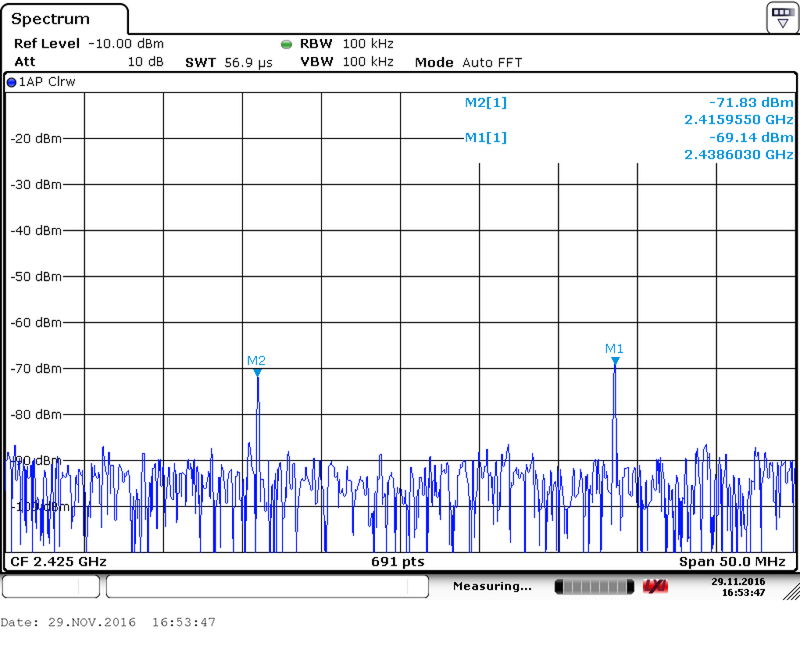 Scanning lower frequencies shows that the highest peak is around 360 MHz, but that is likely because of the sensitivity of our probe and not due to something related to the HiFiBerry board. I'm pretty sure these emissions are indeed connected with the HiFiBerry itself. 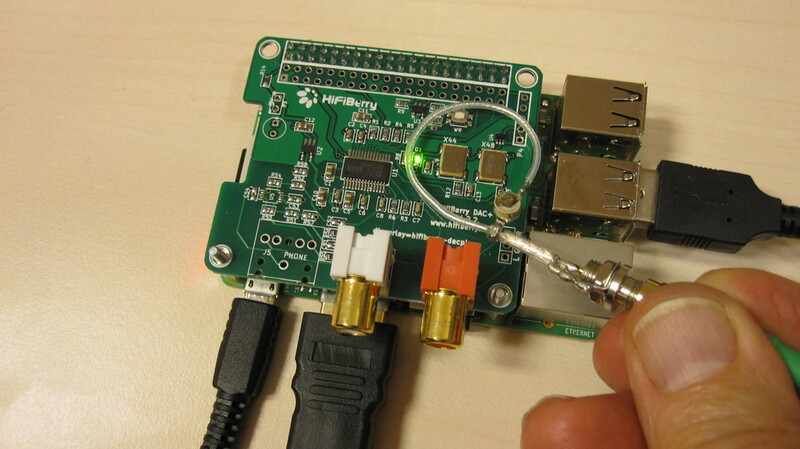 With the probe on Raspberry Pi board underneath HiFiBerry, the spectrum analyzer barely registered any activity. Unfortunately, I forgot to take some measurements with a 2.4 GHz antenna to see how much of this is radiated out into the far-field. I'm guessing not much, since it doesn't seem to affect nearby wireless devices. Related to that, another experiment points towards the fact that this is an EMI issue. If you connect a Wi-Fi dongle via a USB cable to the Raspberry Pi, it will work reliably as long as the dongle is kept away from the HiFiBerry board. However if you put it a centimeter above the HiFiBerry board, it will lose the connection to the access point. In conclusion, everything I saw seems to suggest that this is a hardware issue. 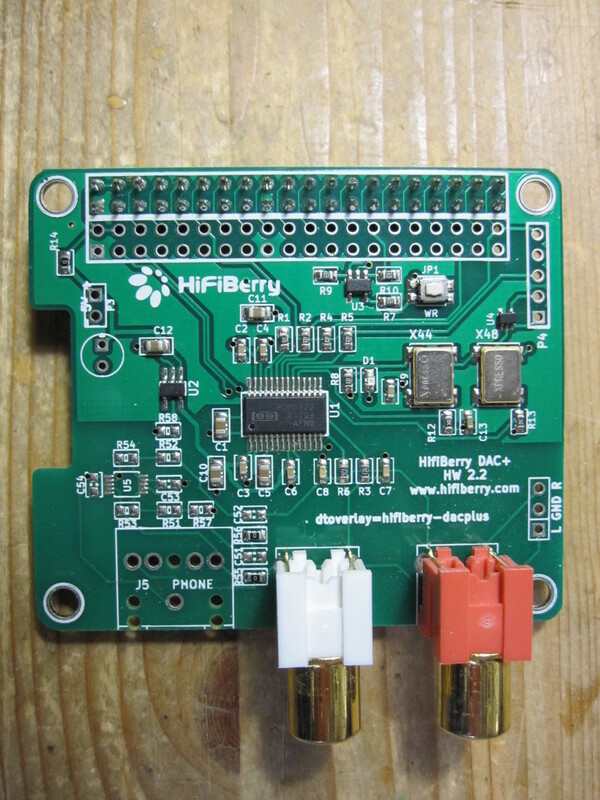 Unfortunately the design of the HiFiBerry board is not open, so it's hard to be more specific or suggest a possible solution. 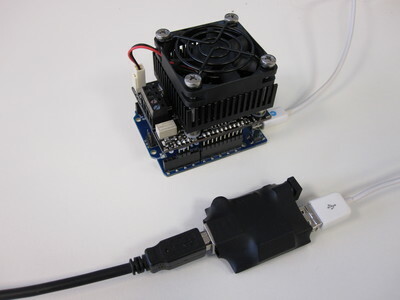 The obvious workaround is to use an external wireless adapter on an USB extension cable, located as far as feasible from the board. I should stress though that the measurements we did here are limited by our probe, which was very crude, even compared to a proper home-made one. 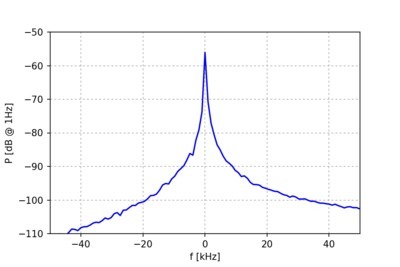 While frequencies of the peaks are surely correct, the measured amplitudes don't have much meaning. Real EMI testing is done with proper tools in a anechoic chamber, but that is somewhat out of my league at the moment. A few days ago I described how a Texas Instruments CC1101 chip can be used to transmit a low bitrate BPSK (binary phase-shift keying) signal using the minimum-shift keying (MSK) modulator block. I promised to share some practical measurements. The following has been recorded using an USRP N200 with sampling frequency of 1 MHz. Raw I/Q samples from the USRP were then passed to a custom BPSK demodulator written in Python and NumPy. The transmission was done using a CC1101, which was connected to the USRP using a coaxial cable and an attenuator. MSK modulator on CC1101 was setup for hardware data rate of 100 kbps. 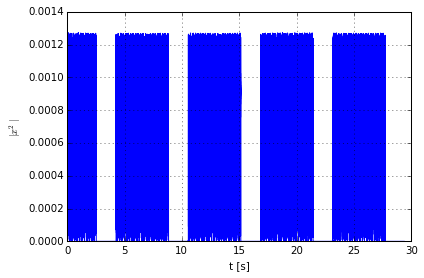 1000 MSK symbols were used to encode one BPSK symbol, giving the BPSK bitrate of 100 bps. The packet sent was 57 bytes, which resulted in packet transmission time of around 4.5 seconds. 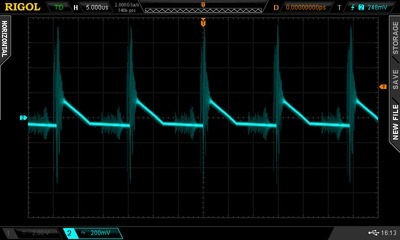 The microcontroller firmware driving the CC1101 kept repeating the same packet with a small delay between transmissions. 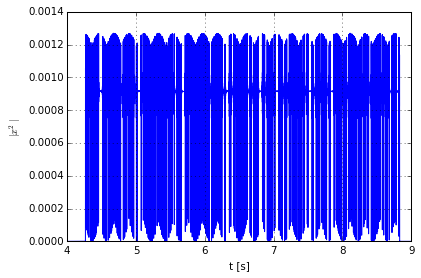 Both the CC1101 and USRP were set to the same central frequency (868.2 MHz). 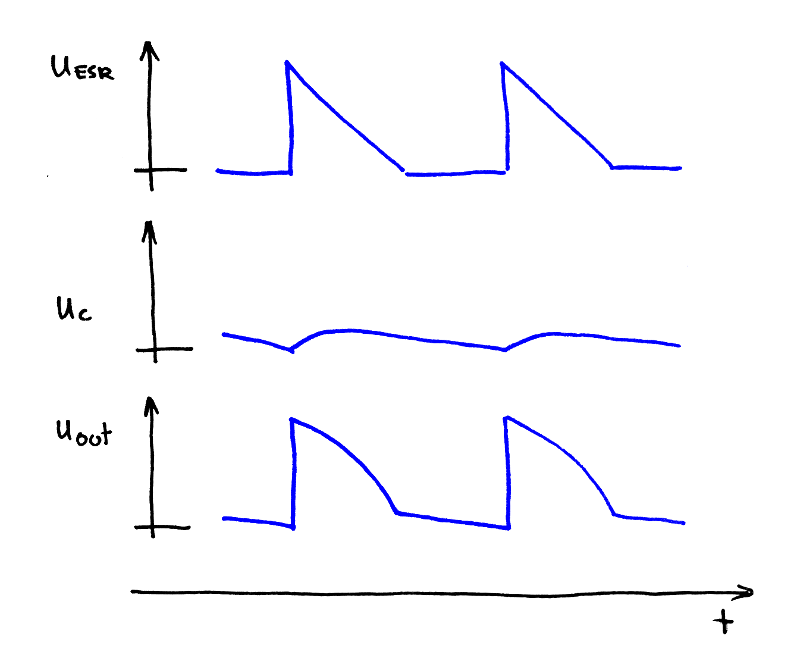 Of course, due to tolerances in both devices their local oscillators had slightly different frequencies. This means that the carrier translated to baseband has a low, but non-zero frequency. You can see 180° phase shifts nicely, as well as some ringing around the transitions. This has to be filtered out before carrier recovery. You can see that the frequency shifts by around 20 Hz over the time of 4.5 seconds. 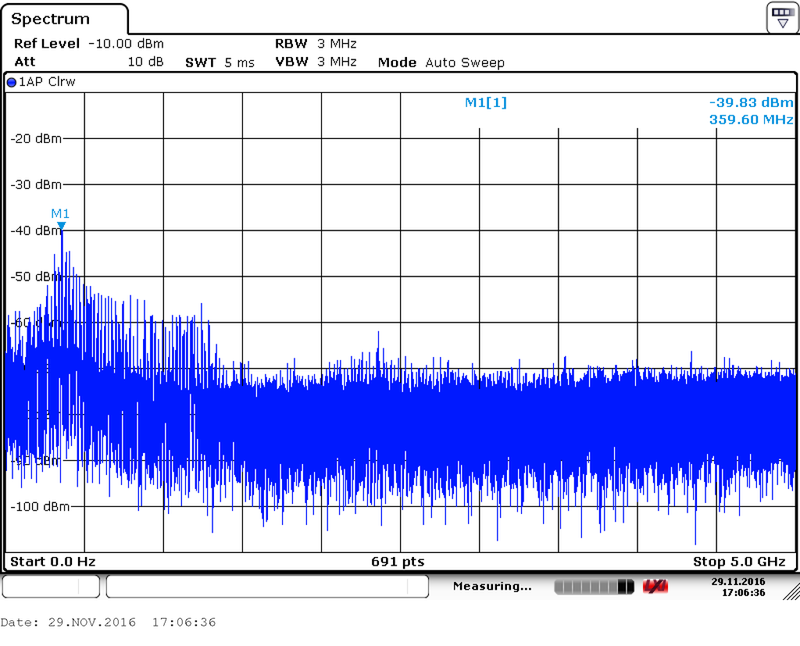 This is around 20% of the 100 Hz channel occupied by the transmission. 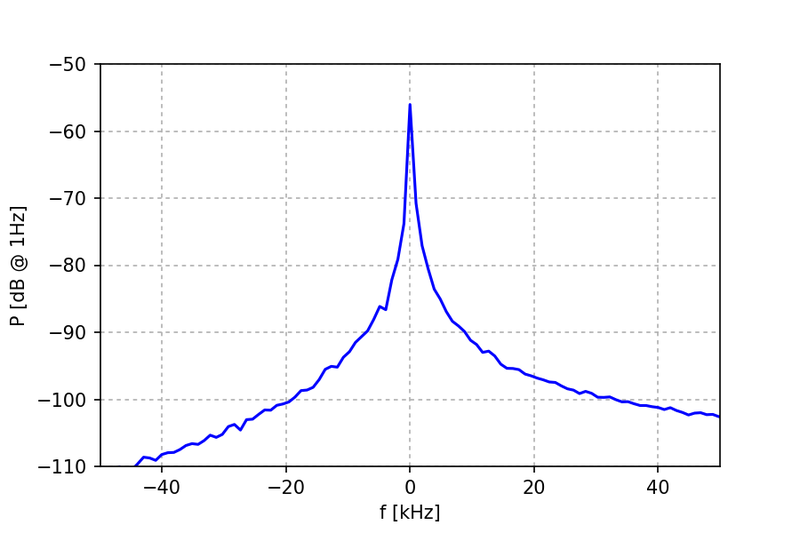 At 868.2e6 central frequency, 20 Hz drift is a bit over 0.02 ppm, which is actually not that bad. For comparison, the quartz crystal I used with CC1101 has specified ±10 ppm stability over the -20°C to 70°C range (not sure what USRP uses, but it's probably in the same ballpark). However, I think the short-term drift seen here is not due to the quartz itself but more likely due to changes in load capacitance. Perhaps the oscillator is heating slightly during transmission. In fact, just waving my arm over the PCB with the CC1101 has a noticeable effect. I'm a pretty heavy Munin user. In recent years I've developed a habit of adding a graph or two (or ten) for every service that I maintain. I also tend to monitor as many aspects of computer hardware as I can conveniently write a plugin for. At the latest count, my Munin master tracks a bit over 600 variables (not including a separate instance that monitors 50-odd VESNA sensor nodes deployed by IJS). Monitoring everything and keeping a long history allows you to notice subtle changes that would otherwise be easy to miss. One of the things that I found interesting is the long-term behavior of power supplies. 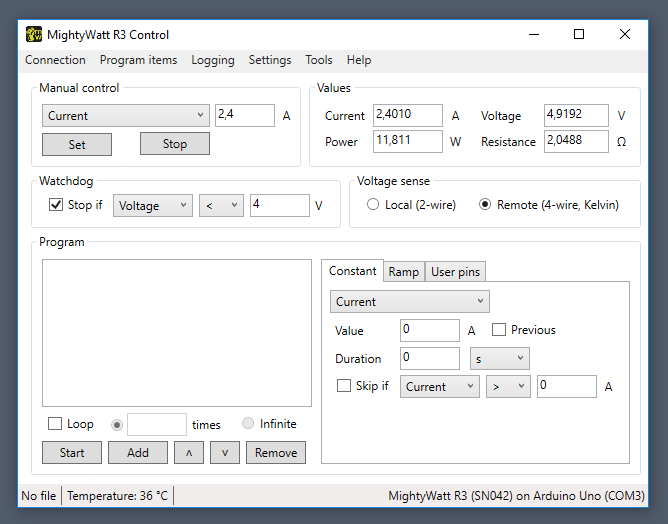 Pretty much every computer these days comes with software-accessible voltmeters on various power supply rails, so this is easy to do (using lm-sensors, for instance). 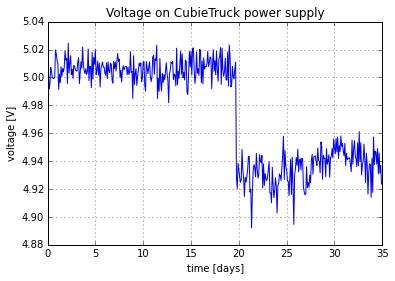 From the start, this power supply seemed to have a slight downward trend of around -2 mV/month. Then for some reason the voltage jumped up for around 20 mV, was stable for a while and then sharply dropped and started drifting at around -20 mV/month. At that point I replaced it, fearing that it might soon endanger the machine it was powering. The slow drift looks like aging of some sort - perhaps a voltage reference or a voltage divider before the error amplifier. Considering that it disappeared after the PSU was changed it seems that it was indeed caused by the PSU and not by a drifting ADC reference on the motherboard or some other artifact in the measurements. Abrupt shifts are harder to explain. As far as I can see, nothing important happened at those times. 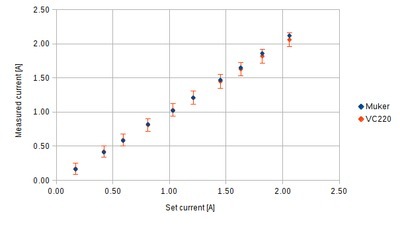 An application note from Linear mentions that leakage currents due to dirt and residues on the PCB can cause output voltage shifts. 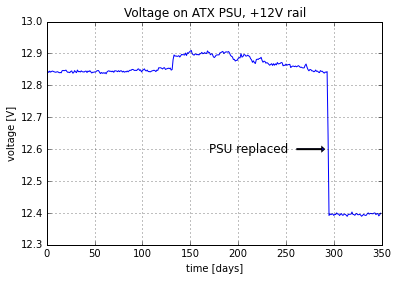 It's also interesting that the +12 V rail on the same power supply showed a bit different pattern. 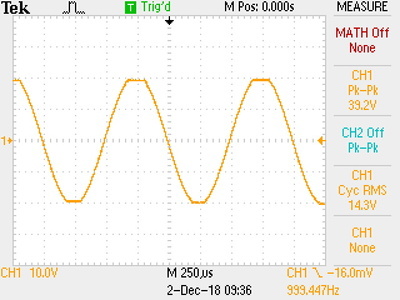 The last voltage drop is not apparent there, so whatever caused the drop on the +5 V line seemed to have happened after the point where regulation circuit measures the voltage. 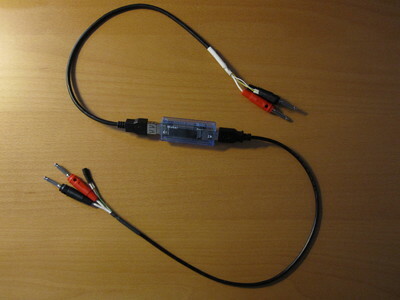 The +12 V line isn't separately regulated in this device, so if the regulation circuit would be involved, some change should have been apparent on +12 V as well. Perhaps it was just a bad solder joint somewhere down the line or oxidation building up on connectors. 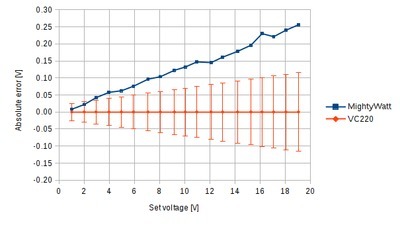 At 10 A, a 50 mV step only corresponds to around 5 mΩ change in resistance. This sort of voltage jumps seem to be quite common though. For instance, here is another one I recently recorded on a 5 V, 2.5 A external power supply that came with CubieTruck. Again, as far as I can tell, there were no external reasons (for instance, power supply current shows no similar change at that time). I have the offending HKC power supply opened up on my bench at the moment and nothing looks obviously out of place except copious amounts of dust. 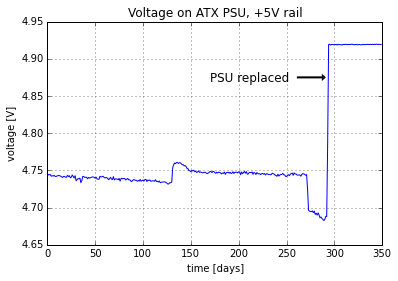 While it would be interesting to know what the exact reasons were behind these voltage changes, I don't think I'll bother looking any deeper into this. 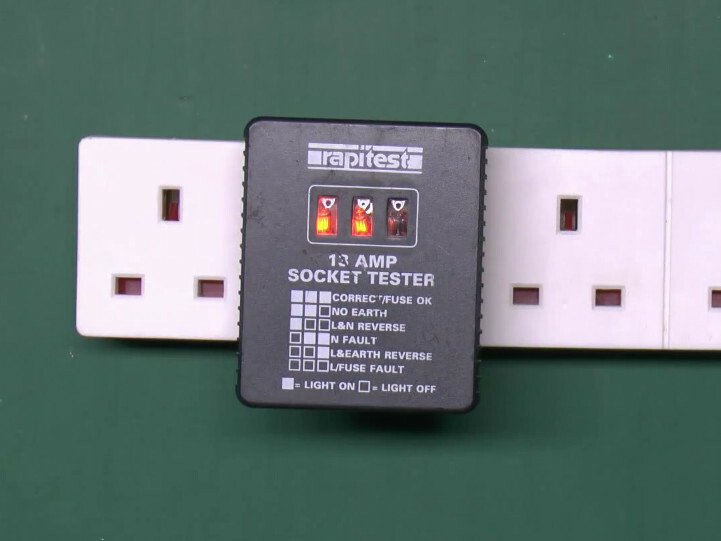 John Ward has a series of videos on YouTube where he discusses the Rapitest Socket Tester. This is a device that can be used to quickly check whether a UK-style 230 V AC socket has been wired correctly. John explains how a device like that can be dangerously misleading, if you trust its verdict too much. Even if Rapitest shows that the socket passed the test, the terminals in the socket can still be dangerously miswired. I have never seen a device like this in person. Definitely they are not common in this part of the world. Possibly because the German "Schuko" sockets we use don't define the positions of the live and neutral connections and hence there are fewer mistakes to make in wiring them. The most common testing apparatus for household wiring jobs here is the simple mains tester screwdriver (about which John has his own strong opinion and I don't completely agree with him there). S1 through S3 are the neon indicator lamps that are visible on the front of the device, left to right. L, N and E are line, neutral and earth pins that fit into the corresponding connections in the socket. It was a bit hard to read out the resistor values from the colors on the video, so there might be some mistakes there, but I believe the general idea of the circuit is correct. It's easy to see from this circuit how the device detects some of the fault conditions that are listed on the front. For instance, if earth is disconnected, then S3 will not light up. 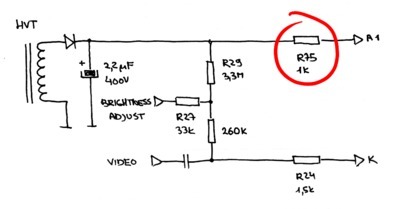 In that case, voltage on S3 is provided by the voltage divider R7 : R8+R1+R2 which does not provide a high enough voltage to strike an arc in the lamp (compared to R7 : R8, if earth is correctly connected). 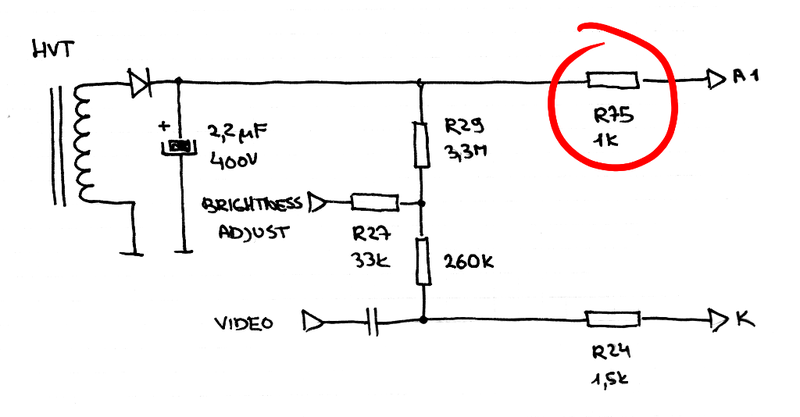 Similarly, if line and neutral are reversed, only the R3 : R5 divider will provide enough voltage and hence only S1 will light up. 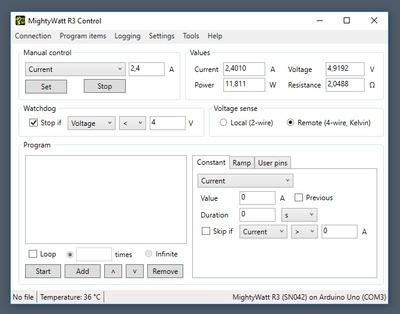 S3 has no voltage since it is connected across neutral and earth in that case. 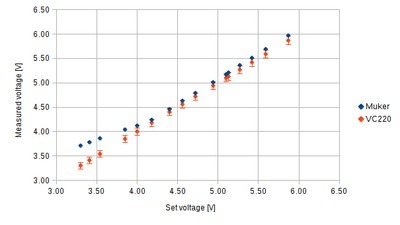 For S2, the line voltage is first halved across R2 and R1 and then reduced further due to R4 and R6. However, it's hard to intuitively see what would happen in all 64 possible scenarios (each of the 3 terminals can in theory be connected to either line, neutral, earth or left disconnected, hence giving 43 combinations). To see what kind of output you would theoretically get in every possible situation, I threw together a simple Spice simulation of the circuit drawn above. A neon lamp is not trivial to simulate in Spice, so I simplified things a bit. 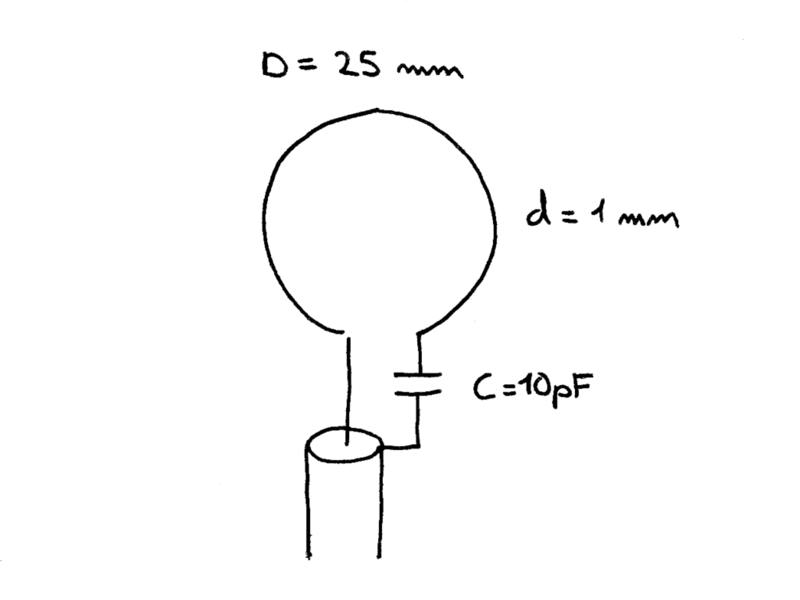 I modeled lamps as open-circuits and only checked whether the voltage on them would reach the breakdown voltage of around 100 V. If the voltage across a lamp was higher, I assumed it would light up. The table below shows the result of this simulation. First three columns show the connection of the tree socket terminals (NC means the terminal is not connected anywhere). I did not test situations where a terminal would be connected over some non-zero impedance. An X in one of the last three columns means that the corresponding lamp would turn on in that case. I marked with blue the six combinations (7, 8, 15, 19, 37, 55) that are shown on the front of the device. They show that in those cases my simulation produced the correct result. It cannot distinguish between earth and neutral (combinations 6, 10 and 11). This is obvious since both of these are on the same potential (in my simulation and to some approximation in reality as well). However, if a residual-current device is installed, any fault where earth and neutral have been swapped should trip it as soon as any significant load is connected to the socket. It also fails to detect when potentials have been reversed completely (e.g. line is on both neutral and earth terminals and either neutral or earth is on the line terminal - combinations 17 and 33). This is the deadly as wrong as you can get situation shown by John in the second part of his video. Under the assumption that you only have access to AC voltages on the three terminals in the socket, both of these fault situations are in fact impossible to distinguish from the correct one with any circuit or device. It's worth noting also that the Rapitest can give a dangerously misleading information in other cases as well. For instance, the all-lights-off "Line not connected" result might give someone the wrong impression that there is no voltage in the circuit. There are plenty of situations where line voltage is present on at least one of the terminals, but all lamps on the device are off. The other day at the Institute, Klemen brought me this microwave motion sensor. Apparently, it was left over from an old municipal lighting project where street lights were to be only turned on when something was moving in the vicinity. I don't know what came out of this idea, but the sensor itself is quite fascinating. There is no manufacturer name on the device. The bottom side of the PCB says GH1420 and IRP/07. It appears to be very similar to the AgilSense HB100 sensor module, but it's probably a cheap knock-off rather than the original. 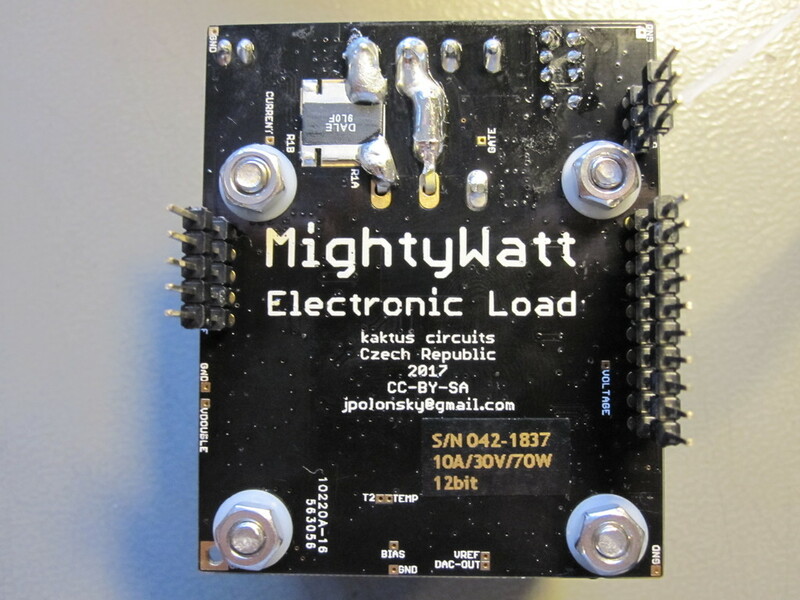 I haven't come across these yet, but it seems they are somewhat popular to use with Arduino (and as cheap DIY 10 GHz sources for amateur radio enthusiasts). The application note from AgilSense contains the block diagram above. 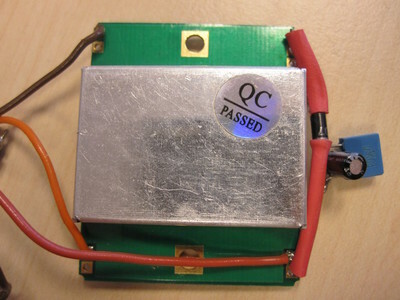 The device transmits a continuous wave at around 10.5 GHz on transmit antenna. Any signal that gets reflected back to the receive antenna is mixed with the local oscillator. If the input signal is Doppler-shifted because it reflected off a moving object, you get some low frequency signal on the output. 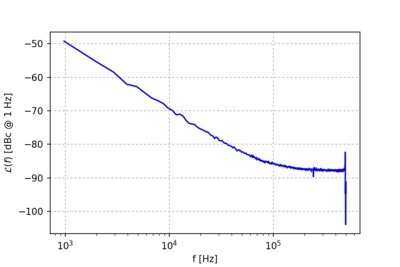 The application note says that a typical signal is below 100 Hz and in the μV-range. After removing the metal can, the circuit appears fantastically minimalist. There are only two semiconductor elements, two passive elements and a dielectric resonator. 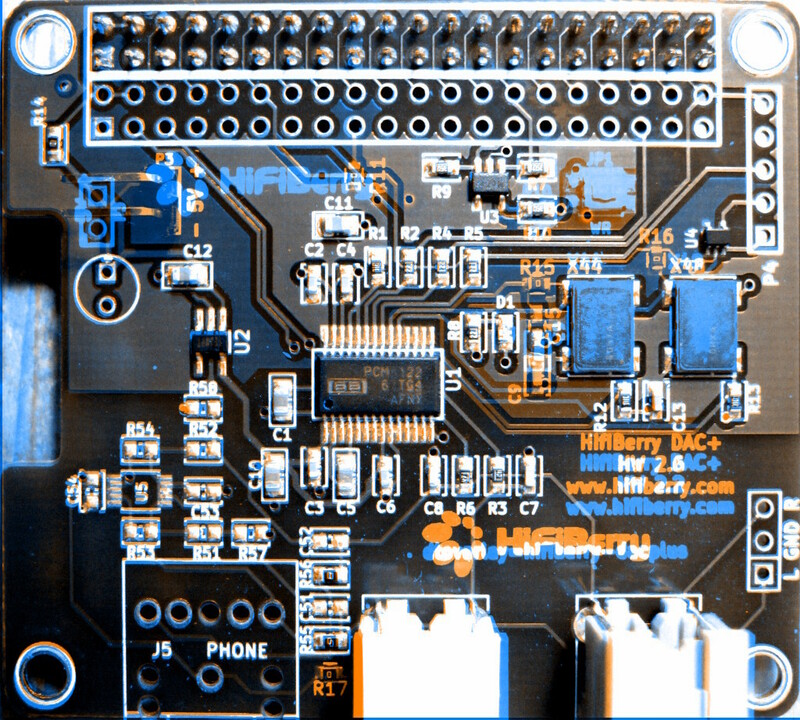 The PCB substrate feels like plain old FR4. Copper traces are covered with solder mask and have what looks like immersion gold finish - unusual for a microwave RF circuit. If it weren't for the transistor in the high-frequency SMD package and the PCB microstrip wizardry, I wouldn't believe this runs at 10 GHz. 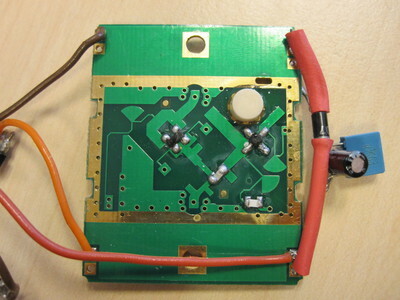 They didn't even bother to solder the RF shield can onto the ground plane. I'm not very familiar with extremely high-frequency design, but this does look more or less like what the block diagram above promises. The X shaped element is most likely a high-frequency NPN transistor used as an oscillator. Base is upper-right, collector is lower-left and the two remaining pins are the emitter (with vias to the ground plane on the other side). The +5 V power lead provides collector voltage through a resistor on the lower-right. 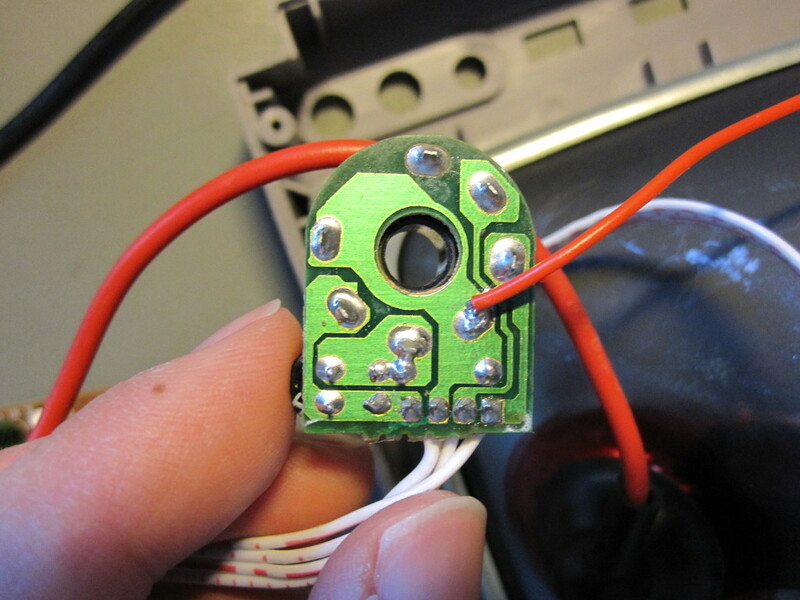 The quarter-circle things on the PCB are butterfly stubs in low-pass filters. 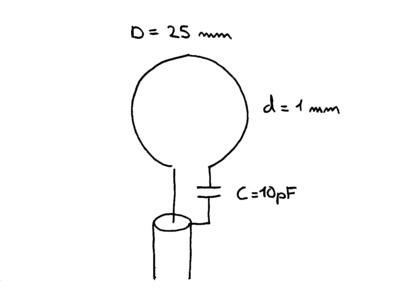 The collector of the transistor is capacitively coupled with the base through the white cylindrical resonator. This provides the feedback that drives the oscillator. What's interesting is that there is no bias on the base of the transistor. Either it is working as a class C amplifier or there's something more fancy than a plain bipolar transistor in that SMD package. 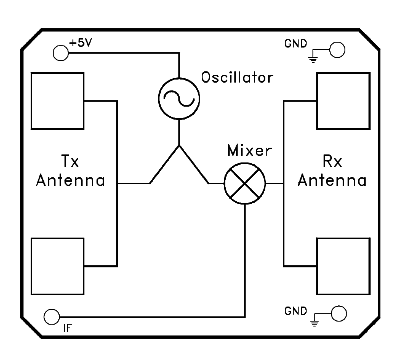 The output of the oscillator is coupled to the transmit antenna on the bottom and to the mixer in the center. The little rectangular stubs on the way probably help with impedance matching or some filtering of oscillator harmonics. The trace from the receive antenna comes in on the top of the picture. 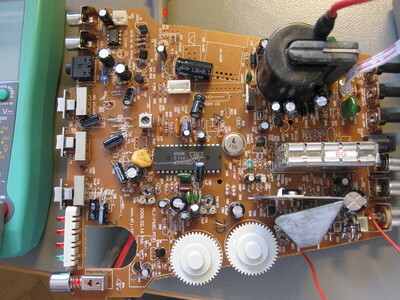 The mixer is probably some kind of a diode arrangement, although I don't recognize this setup. The low-frequency output from the mixer then exits through another low-pass filter to the lower-left. Apparently that's all you need for a simple Doppler radar. I was surprised at the extreme minimalism of this device and the apparent huge divide between design effort and manufacturing costs. I'm sure a lot of knowledge and work went into figuring out this PCB, but once that was done, it was probably very simple to copy. I wonder if this specific setup used to be covered by any patents. 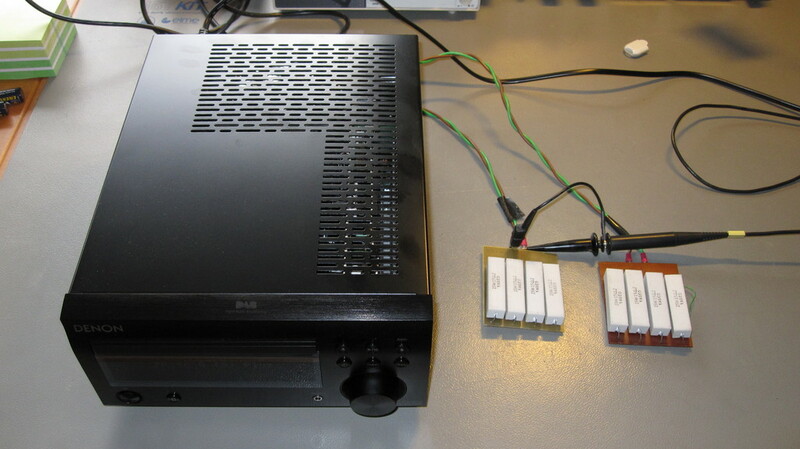 Cheap audio dongles based on C-Media chips are a convenient source of USB-connected audio-frequency DACs, ADCs and even digital I/Os with some additional soldering. Among other things, I've used one for my 433 MHz receiver a while back. Other people have been using them for simple radios and oscilloscopes. 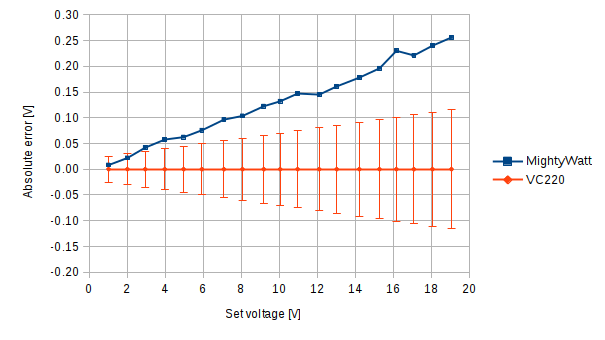 Apparently, some models can be easily modified to measure DC voltages as well. Of course, you get what you pay for and analog performance on these is not exactly spectacular. The most annoying thing is the amount of noise you get on the microphone input. One interesting thing I've noticed though is that the amount of noise depends a lot on the USB bus itself. The same device will work fine with one computer and be unusable on another. USB power rails are notoriously noisy and it's not surprising that these small dongles don't do a very good job of filtering them. 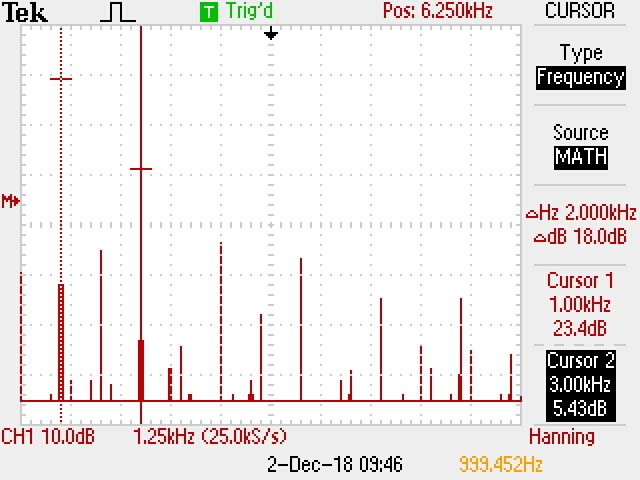 To see just how much the noise level varies with these devices, I took some measurements of digital signal power seen on the microphone input when there was no actual signal on the input. I tested two dongles: one brand new (dongle A) and an old one from the 433 MHz receiver (dongle B). Dongle B is soldered onto a ground plane and has an extra 10 nF capacitor soldered between +5V and ground. In all cases, the microphone input was left unconnected. I also took two different unpowered USB 2.0 hubs and tested the dongles when connected directly to a host and when connected over one of these two hubs. For USB hosts, I used a CubieTruck and an Intel-based desktop PC. 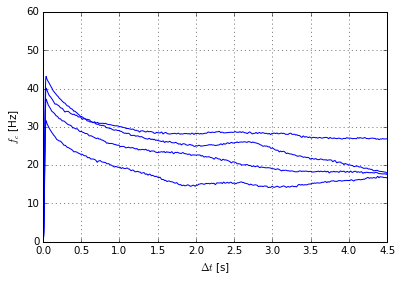 Each point on the graphs above shows signal power (x2) averaged over 15 seconds using 44100 Hz sample rate. 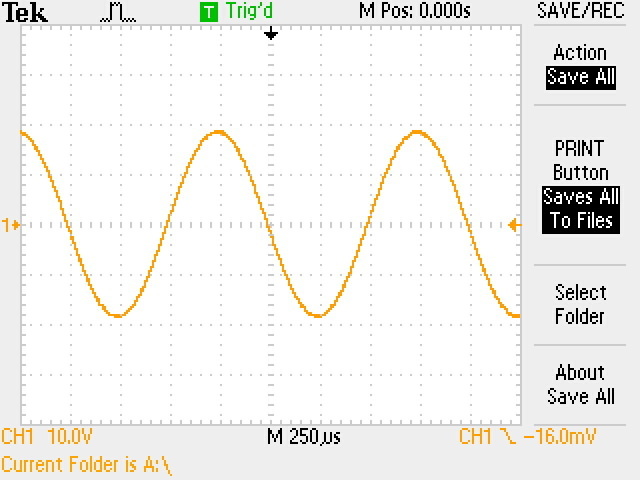 0 dB is the maximum possible digital signal power. Both dongles use signed 16-bit integer format for samples. 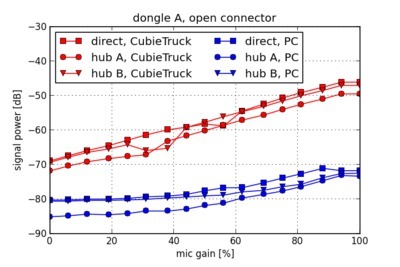 I varied the microphone gain of dongles as exposed by the ALSA API ("Mic" control in capture settings). The automatic gain control was turned off. 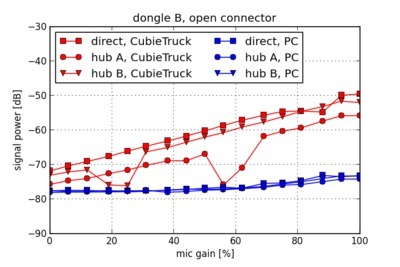 You can see that dongles connected to the CubieTruck performed much worse than when connected to the PC. 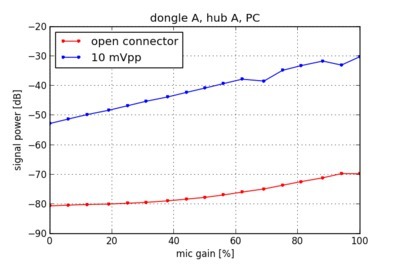 It's also interesting that dongles connected over hub A seemed to have a lower noise floor, although I'm not sure that difference is significant. 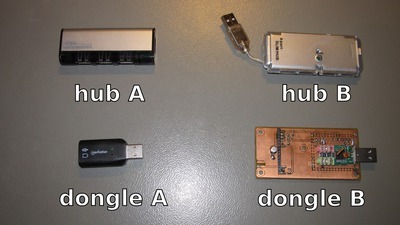 It's likely that USB noise was also affected by unrelated activity in the host the dongles were connected to. 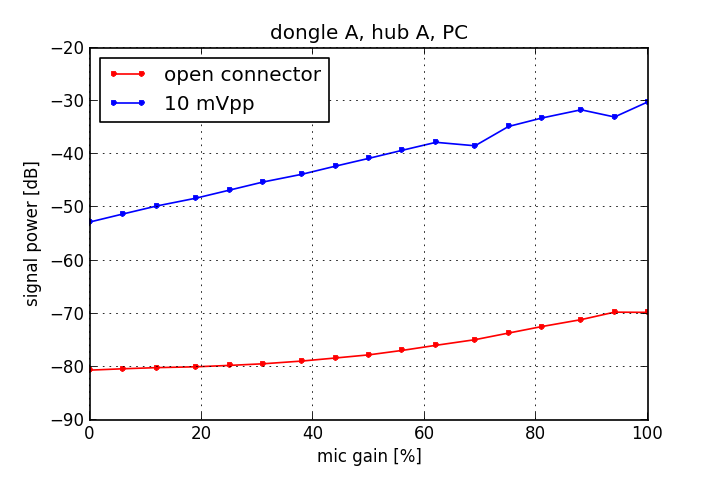 For comparison, above is how signal power looks like versus gain when a 10 mV peak-to-peak sine wave is connected to the dongle's input. You can see that the microphone gain control allows for a bit more than 20 dB of variation in gain. 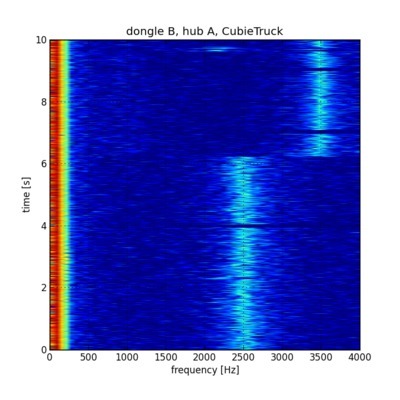 What is causing so much noise on CubieTruck? 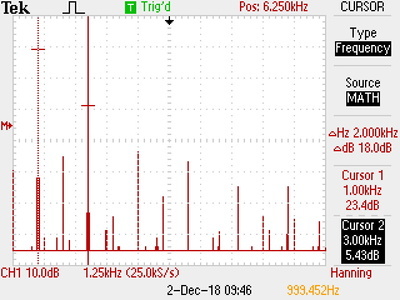 Looking at the spectrum of the noise recorded by one of the dongles, there appear to be two distinct parts: one is on low frequencies at around 100 Hz and below. I would guess this comes from the mains hum and its harmonics. The other part is between 2 kHz and 4 kHz and changes in frequency often. Sometimes it also completely disappears (hence strange dips on the graphs above). I'm guessing this comes from some digital signals in the CubieTruck. There's really not much you can do about this. The small PCBs don't allow for much additional filtering to be botched on (the little ceramic capacitor I added certainly didn't help much) and it's not worth doing something more elaborate since then making your own board from scratch starts to make more sense.